Is there an optimal lot size that makes a compelling case for a part to be considered as a friction weldment? This is a question we hear often and there are a couple of factors to consider. In most cases, friction welding is best suited to serve industrial organizations with higher volume part demand. However, based on the size of the part (specifically the diameter changes) and the material being specified, lot sizes as low as 5 to 10 pieces can save you significant amounts of money in materials and throughput. Below I will cover some of the specifics about the ranges of batch sizes that roll through our plant. Friction welding is a machine based operation. As such, it requires tooling to hold unusual part configurations. As tooling complexity increases so do the time to set up the tooling to run orders. Basic shapes can be set up more easily with standard clamps and chuck jaws. The need for machine setup makes orders with one or just a few pieces less feasible because a minimum charge takes effect and drives up the part price. A key advantage to a machine based operation is repeatability. For instance, the stainless steel part in the video below has a 7” round welding to a 2” shaft. If you only have a requirement for 5 of these pieces it is probably best to just turn it down from one solid piece of bar stock. However, when dealing with a batch size of 50 pieces and higher, the setup cost is amortized over a larger quantity. Watch the video below to see these parts being made and the material savings that were realized. Occasionally a part is presented to us with unique design requirements that only friction welding can fulfill. In those cases, the expense of producing a small order has value to the customer. A unique order that came our way recently was an exception to the higher volume rule. A chemical research facility needed to replace a pipe that connects two vessels and the design called for a bi-metal application. 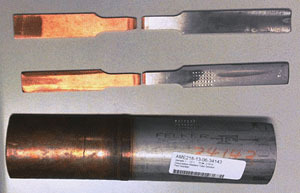 Copper pipe was required to bond with a stainless steel coupler, hold pressure, and remain leak-proof. The unique ability of friction welding to produce a superior bi-metal bond made the limited size of this custom order worthwhile. There are times where a part does not have significant volume and friction welding still makes the most sense. These are typically found in parts with large diameter changes. For instance, a customer approached us with high alloy steel part with a 6 ½” OD that was roughly 5 feet in length. 48 inches of that bar was getting turned down to an approximately 3 ½ ” OD shaft. Even though the batch size was considerably small, a quick investigation showed that even for just 5 pieces, at this size, the customer was able to save over 50% in the material (see video below). Their throughput time for finish machining the part was always increased dramatically. 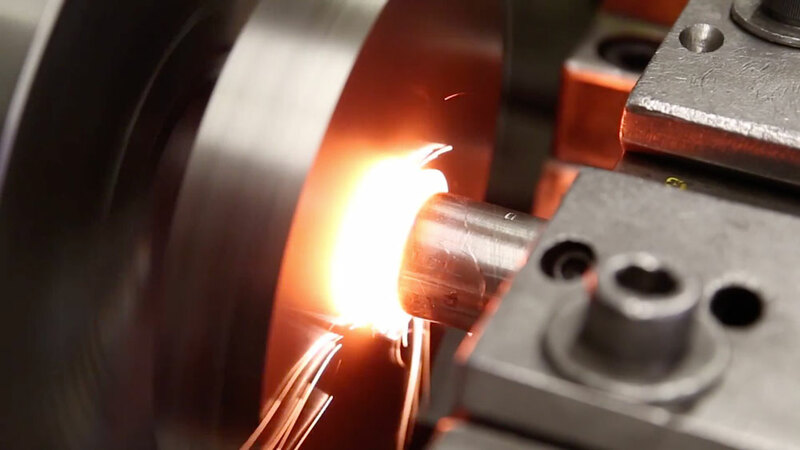 Our facility includes several dedicated cell configurations that allow a single operator to move components through the friction welding process and into final machining operations for customers requiring finished-to-print items. These cells were designed to be part family specific for ongoing monthly production runs. Because of the narrow heat affected zone, a recently welded part can easily be handled outside of that zone immediately after. This allows multiple operations to be done in cycle time while keeping costs in check and seamless material flow. Friction welding is also a process that can be automated for extremely high volume work requiring a constant part flow. Our company operates two specially designed automated cells that can produce many thousands of weldings per month. We are not averse to expanding these capabilities, quickly securing capital equipment, and rolling them out as needed. The inference on batch size is that there are a number of variables to consider before concluding that your part has too little or too much volume. Size, materials, and machinability all need to be considered and that is where I would invite you to lean on AFW for our expertise in determining the feasibility of making your part out of a friction weldment. Have a part in mind? Give me a call or shoot me an email today!